Isn’t it interesting that everybody has their own style of drawing and making visual things? It almost suggests that we actually see things differently. Perhaps each of us is looking through our own lens that has particular scratches and distortions that come from the years of accumulated experience. We may all be striving to capture the same reality in front of us and yet, despite skill and practice, end up with very different marks on the paper and the same sense of satisfaction that we have actually captured what was in front of us. Even if you change media and techniques or look at your work over a lifetime, it is still you. What I find is that my own lines are usually recognizable to me right off, but only my more mature lines are recognizable to others. My’ style’, if you will, took time to emerge. I have a friend with whom I go on drawing trips so we plunk down and draw the same thing simultaneously. It’s wild to see how different we see things when we swap books, how we chose to draw different details, how we envy each other this observation or that. Style is not just true of drawing but, if you let it, of the way you write, letter, design, etc. in your journal too. The only real trick is to be yourself. That means letting go of fear and judgment, not worrying about being “stuck with a bad drawing … forever.” The fact is, a “bad drawing” is just a drawing you don’t feel captured the moment the way you’d intended. You didn’t reach the destination you thought you saw on the horizon. Maybe you were distracted, maybe you were hungry, maybe you were nervous that someone would look over your shoulder and snicker � maybe you just weren’t yourself. 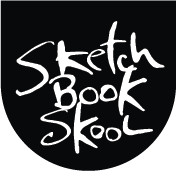 I say, better to keep all those drawings, and keep them in your sketchbook where they can be lessons. Honestly, I learn far more from those ‘mistakes’ than anything else and even more from my inevitable attempts to ‘fix’ the ‘mistakes’. I slather on watercolor or go over the line with a heavier pen and get an even bigger mess but I learn something. My books are all numbered, carefully chosen, beautiful paper, often hand bound, and the idea of having a big turd in the middle of the book used to be very depressing. Now I flip back and remember how I went astray and am the wiser for it. 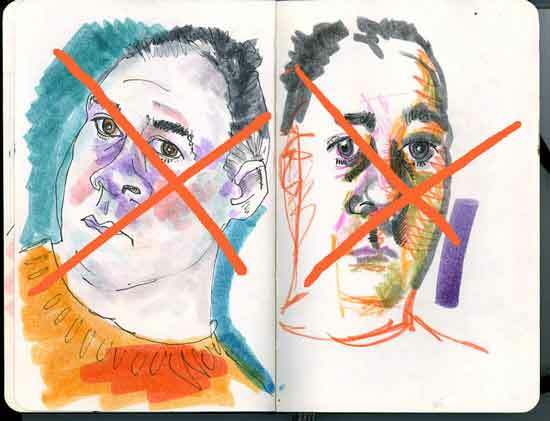 If you commit to leaving everything in your book, you’ll find you do each drawing a little more carefully, knowing “you’ll be stuck with it.” And, if not, so what? It’s just a journal, right? Better to let it all hang out and be yourself than masquerade as some impeccable genius who always bats 1.000. That’s not you, is it? It sure ain’t me. So, back to ‘finding your voice’. It’s like any sport: you’ve got to practice and stretch. Try drawing like someone else, go so far as to copy others’ drawings line by line. You won’t actually end up with a copy but your drawing of their drawing. Then make yourself draw the same thing over and again. Or draw something incredibly complicated, like your car’s engine or every hair on your arm — really detailed, highly accurate drawings. Then do something wild, draw with a fat brush, a sharpie marker on paper towel, whatever loosens you up. The same is true of writing. Try writing in verse, with no adjectives, incredibly tersely, whatever. Look at how magazines are laid out and let that inspire your journal. The New Yorker is very dense and then explodes with a big picture. The National Enquirer shouts in lots of display faces, USA Today uses interesting info graphics. Why not graph what you eat for lunch or how many miles you drive and where? It’s all meant to be fun and expand the pleasure and appreciation you have for life. Anyone who looks at what you are doing will just be impressed by the fact that you are doing it at all. And if they don’t like it, well, it’s your journal, not theirs anyway. Your journal is your baby. Love it, feed it, give it variety, and no one else will tell you if it’s a little odd looking. Sorry if this is a little rambling but I hope it’s helpful.